With a prestigious business address, you can give your business a strategic presence in addition to the centre's virtual office options. There is a team on-site that is happy to help with reception services, mail handling and telephone answering, giving your business the opportunity to work efficiently and practically. There are meeting rooms, available on a flexible basis. Around the centre is a multitude of local amenities to enjoy outside of work. This impressive building consists of office spaces provided with advanced videoconferencing facilities, lounge area and parking facilities and helipad. Modernly furnished, it offers a highly professional environment, ideal to run successful businesses. Feel free to convene meetings in the centre's well designed collaborative zones and conference facilities. 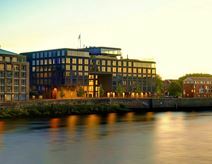 Located in Bremen, an important commercial city, these office spaces benefit from excellent connections and transport links. Located in the heart of Bremen, this business centre provides a range of flexible workspaces including private offices, collaborative coworking spaces, meeting rooms and virtual office options. With a stylish and contemporary design, these spaces are guaranteed to impress you and your guests. Fully equipped with ergonomic furniture, high speed wifi and an on-site management team to support you throughout the day, your working day will go smoothly in this space. You will also benefit from a community of entrepreneurs with whom you can share ideas and grow. This business centre is centrally located in Schwachhausen, one of Bremens most prominent business locations. Public transport links abound, and this elegant Art Nouveau building provides comfortable and impressive workspace accommodation to suit individuals or teams. The centre provides meeting and conference rooms, and a business lounge that can be booked. Within the immediate area, you can find within walking distance hotels, restaurants, and an art gallery. This modern building has been fitted out to a very high standard and offers exclusive offices which are perfect for larger project groups or international companies. The centre is located within a brand-new campus and is connected directly to the University of Bremen. You will have excellent transport links with 500m and direct access to he A27 making it convenient to commute to and from. Becoming part of this community you will benefit from 24-hour access, on-site management team, breakout area, reception services, communal kitchen and on-site meeting rooms. 1050 sqm big and offers offices starting for 2 persons up to 10 persons in a prime location. There are spacious community lounges as well as an activity room. With 24 hour access, you can take advantage of well designed workspaces at your disposal, with IT support and virtual office options to keep you well connected. The nearest bus and train station is conveniently 100 metres away, with a fantastic selection of restaurants and cafes within the centre's locality. Set in an historical villa, these office spaces offer a unique combination of modern technology and design within a charming antique atmosphere. There are reception services that will handle your telephone answering so you can focus on the bigger projects while your clients are greeted and impressed with the utmost courtesy. AV equipment is installed and there is shared internet provided. The central location and the excellent transport links, with the railway station and the airport located just a few minutes away, will contribute to enhance the image of your business. This business center enjoys superb transport connections, with parking available on the premises. The center in located in the heart of Bremen, and offers office space and conference facilities for immediate occupation. This is a first-class work environment, available now. There is also a range of support services provided onsite, such as administrative and IT support, a secretarial team, telephone answering services, and spacious breakout/lounge spaces.